Hey everyone. This is my first post here. Also this is my first time owning a motorcycle of my own. I've been wanting a cafe racer since I was in high school. Now 31 and a divorced single father, I scoured the internet for weeks for a good cafe project. Instead I found a guy cleaning out his barn, selling 5 honda cb's and stole them for $300. I acquired a 73 Cl350, 78 CL360, 78 CB360, Cb750 "hondamatic", a 78 CB550 that had no engine and an unknown year 750 frame and parts all disassembled. Best part is I ended up posting the 750 hondamatic up on Craigslist.. And sold it for $300. So here's where I'm at. Decided to start the 1973 CL350 as my first ride. Any insight is greatly appreciated and I may have gotten myself in deeper than I needed to. But I'm having fun. Here's my progress so far. The last two pictures are of the 550 I plan on building next and the engines I bought on Facebook classifieds for $100. Just stripping it down. Sandblasted the frame. Was going to build a powder coating oven but decided I just want this guy to go back together and run. Building a list of parts I'm going to order to freshen things up but gotta wait a few weeks until I have money to buy. Hopefully I can finish this build soon! And this place seems to be the mecca for information and wisdom if I need it... And I'm going to need it. Cheers! Found some time recently to continue cleaning up and rattle can her up. If you can see the video.got around to wet sanding, polishing and waxing the rank today. Mighty impressed with Dupli-Color paint from cans! A little bit at a time. Ordered rear shocks off eBay. Trimmed the eBay seat to fit around the tank mount. That's a really great buy, your lucky you found something so cheap and yet so... not in hundreds of pieces. When I bought my 1982 Suzuki GN 125 for $300, it was just the frame, engine, and the trans all together. Everything else came in 4 full boxes of parts. Oh yeah, and a exhaust pipe made from a post from a metal fence. Haha, that's a fantastic exhaust idea - speaking of, I was thinking about cutting off the existing mufflers and either welding or clamping on some cheap, slim mufflers. Any suggestions? I want sleek and slim. Not tuba horns like everyone seems to love so much (no offense). Great haul and your paint looks very good too! 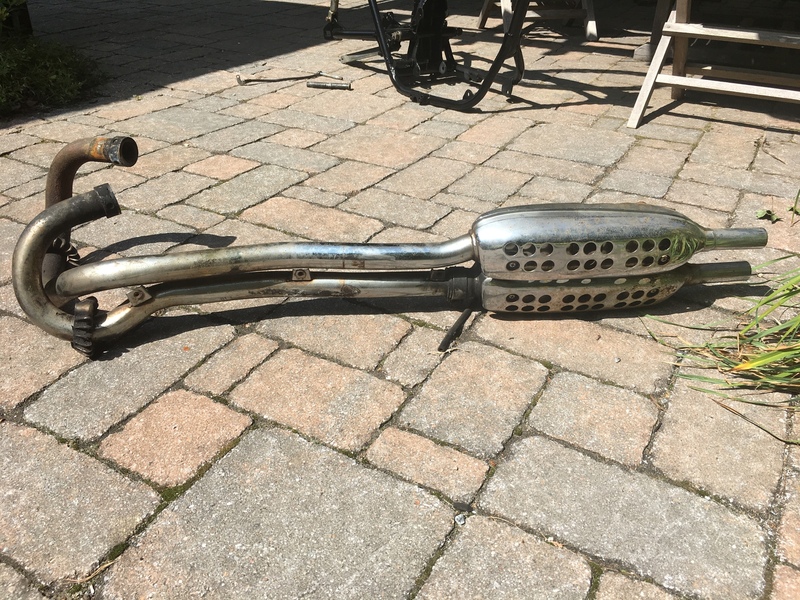 If I were you I would not cut that upswept exhaust, sell it instead or keep it intact. A lot of people would give their right nut for those pipes if they are in good condition. I'd say they're pretty decent. Any idea what it'd be worth? For your muffler, check out these.